Thanksgiving is already upon us. Supermarket isles are filled with large turkeys, hams and sauces packed with luscious cranberries and pineapples. If you’re just recovering from the back to school rush, do not fear, we have you covered! These recipes are chock full of spices and flavour and are sure to please. Just grab the recipe and head to the supermarket. Combine brown sugar, lime juice, rum, soy sauce, Worcestershire sauce, olive oil, pepper and parsley, and mix well. Place chicken breasts in a large resealable plastic bag, add brown sugar marinade and refrigerate for at least 30 minutes. Turn chicken over occasionally while marinating. Remove chicken and discard marinade. Spray a large nonstick skillet with cooking spray and heat over medium heat until hot. Add chicken and cook 5-6 minutes on each side until chicken is no longer pink in the center. 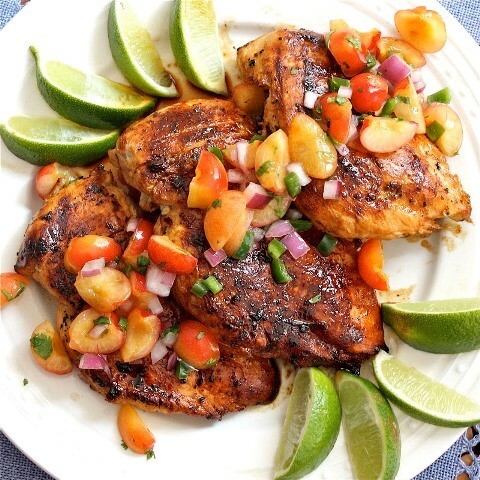 Squeeze lime juice over chicken and serve with salsa (optional). 1. Lightly score the ham, criss-cross, and place in a roasting pan. 2. Mix the brown sugar, rum, mustard and syrup. Spoon sauce over the ham and bake in 425°F oven for 30 minutes. Lower temperature to 375°F and continue to roast for another hour. Baste frequently. The top should be well browned and crispy in texture. 3. Let sit for 30 minutes covered with foil before carving. In a food processor, process blueberries, rum, lemon juice, garlic cloves, brown sugar, onion and white vinegar until smooth, stopping to scrape down sides. Pour mixture into large plastic freezer bag; add pork. Seal and chill at least 4 hours. Grill pork, covered with grill lid, over medium heat (300° to 350°) 11 to 13 minutes on each side or until a meat thermometer inserted in thickest portion registers 155°. Remove from grill. Loosely cover pork with foil; let stand 10 minutes. Cut pork into slices, and serve over toasted bread. Original Recipes featured above are provided by Keisha Blair.